Sculptor and painter. Born in 1875 in Kraków, died in 1964 in Warsaw. Xawery Dunikowski was a highly rebellious and defiant artist. At every stage of his extensive creative life, he surprised and shocked his audience while often being intellectually and psychologically far ahead of the eras in which he worked. His works were often described as 'Plaster Monsters'. During the period of Young Poland (1890 – 1920), he created symbolic sculptural groups, such as Tchnienie / A Breath of Air, Jarzmo / Yoke, Macierzyństwo / Motherhood and Fatum / Fate - which were all regarded upon as twisted and bizarre epithets. Another work, Kobiety brzemienne / Pregnant women became a cause of scandal, not so much because of the form, but rather the theme as at that time the depiction of a pregnant woman was regarded as immoral. In addition, the artist set his works directly on the floor without the use of commonly used sculptural pedestals. The first official exhibition of the works by Dunikowski was organized in Kraków in 1902. It brought out contradictory opinions from the critics. There were many evaluations negating the meaning of the creativity of the artist, describing his works as gypsum frights or wagging heads. On the other hand, such eminent critics as Cezary Jellenta, Jan Kleczyński and Eligiusz Niewiadomski counted themselves as early enthusiasts of his work. Today, the early period of Dunikowski is considered to be one of the most interesting phenomena in European art at the beginning of the twentieth century. The creative path of Dunikowski was characterized by the restless variety of his artistic searching and his abundance of original solutions. In the beginning of his artistic career he was inspired by the work of Auguste Rodin due to the influence of his teacher Konstanty Laszczka. This was expressed by a sensitive style, full of chiaroscuro nuances in his way of shaping form (Prymulka, 1898; Portret malarza Henryka Szczyglińskiego, 1898). However, by the first years of the twentieth century he had created his own original style breaking with the dominant style of Polish mannerism called Rodinowska. In his most outstanding works of this period such as Tchnienie and Fatum, the artist gained the power of expression by eliminating detail to create a global, half abstract, angular, strongly constructed block. The topics and the mood of the compositions of the artist from that period of time corresponded with the spirit of Young Poland and the ideology of Stanisław Przybyszewski, the most influential personality from the artistic circle of Bohemia of Kraków. Przybyszewski exhorted artists to break with academic conventions and create works that were an expression of bare soul – an expressive performance of the artist’s subjective feelings and his existential anxieties. His restless and turbulent artistic life was also mirrored in his private affairs. In 1905 he shot and killed a fellow artist and popular Warsaw society figure Wacław Pawliszczak during a quarrel in a restaurant in Warsaw. He was arrested and released on bail while being charged with manslaughter. However, he was never tried by the Tsarist justice system. An Austrian subject, he eventually went to Kraków and never served any time nor paid any retribution to the deceased family for his crime. He left for Paris before the beginning of World War I and served for five years in the French Foreign Legion, a well-known refuge for men with criminal pasts until he returned to Kraków in 1921. His Parisian period (between 1914-1921) incited a scandal resulting from the presentation of a work named Autoportret. Idę ku słońcu / Self-portrait. I am going towards the sun, which depicted the artist dressed as Adam, walking proudly with the conviction of his unique genius. In addition, his work bore the hallmarks of the impact of the fashionably French Cubist style – a style completely incomprehensible on Polish soil. During the interwar period, Dunikowski proposed a monument called Wdzięczności Ameryce / Gratitude to America, using innovative shapes with fountains that aroused indignation to such a degree that it was decided to remove it. The press at the time wrote headlines, 'crying out to heaven for vengeance' and recognized the work as 'abortive'. Many of the sculptures Dunikowski created in this time were rejected. Even when he managed to get a lucrative contract, as in the case with the Głowy Wawelskie / Heads of Wawel, the project was never completed as planned despite the many years spent on assumptions regarding the implementation of the monument. Ultimately, the decision was made not to put the heads in the allocated place. All of this came to halt in 1940 when he arrested by the Gestapo and imprisoned in Auschwitz for the duration of the war. After the war, the artist gave way to the ideas of socialist realism. This made no difference however in his talent for creating scandal. His demonic bust of Lenin aroused 'consternation', while the artist’s sculptural creation of Joseph Stalin represented 'a dwarf with a big paw', and after it’s unveiling, 'mute astonishment ensued' among spectators. Dunikowski had never been comfortable with any ideology or power. He simply wished to pursue only his own, true unfettered vision. Dunikowski studied sculpture in Warsaw under Bolesław Syrewicz and Leopold Wasilkowski. After finishing in Warsaw he moved to the School of Fine Arts in Kraków, again studying sculpture for two more years in the workshop of Alfred Daun and Konstanty Laszczka. Between the years of 1904-1914 he was a professor of sculpture at the School of Fine Arts in Warsaw. Throughout this period Dunikowski travelled to various countries including Egypt, Italy and France. In 1914, just before the outbreak of the First World War, Dunikowski settled in Paris. Upon returning to Poland in 1923, Dunikowski took over the department of sculpture at the Academy of Fine Arts in Kraków, a position he did not leave until he was arrested and deported to the Oświęcim (Auchwitz) concentration camp by the Gestapo in 1940. He remained there until the end of the occupation. After the war he was put in charge of the department of sculpture of the Academy of Fine Arts in Kraków (1945-1955), and then moved to Warsaw permanently. 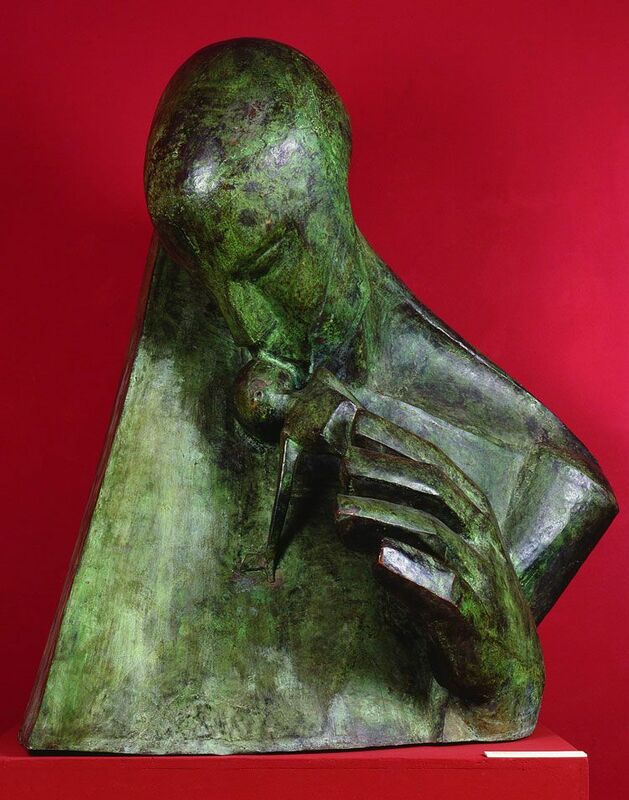 In 1959, he travelled between Warsaw and Wrocław where he ran both the Departments of Sculpture and Architecture at the Higher State School of Fine Arts. After his death in 1965, a museum located in the palace in Królikarnia in Warsaw was opened in honor of his name and in 2001 it was renamed Muzeum Rzeźby Xawerego Dunikowskiego (The Department of the National Museum in Warsaw). The majority of Dunikowski’s work resides in this museum.